I realize this may be out of the current scope for SMC, but honestly it seems to be the most equipped to support it out of everything else I have seen online. The titles are in the system with the publication months/years recorded. The information is already there. The multicolored tag symbols are supposed to represent any comics you have stashed for that particular month/year. One benefit to this would be to see where a particular comic is located on the timeline. Duh, right? But think about this: You know that confusion you get when you pick up a backissue comic and you have a hard time placing exactly when the issue took place? It would be great to see where that issue lies on the timeline, to compare its position with the nearby storyarcs. Then this huge incandescent light bulb switches on in your head, heats up violently, and explodes from the surge of energy this timeline just gave you. "Ohhh, now I know what all the characters are complaining about." Yep, I am the guy who brings a knife to a gun fight. thats cool, i like it. you have stashed, 3 what you have in your wish list. The multicolored tags are up in the air, I initially just meant them to be any comic the user had stashed, not necessarily every comic that came out that month. For titles like DC's 52 and the like which are printed more often than once a month, I think they should be represented correctly, so space would need to be made to have their own column of tags in the span of that month. 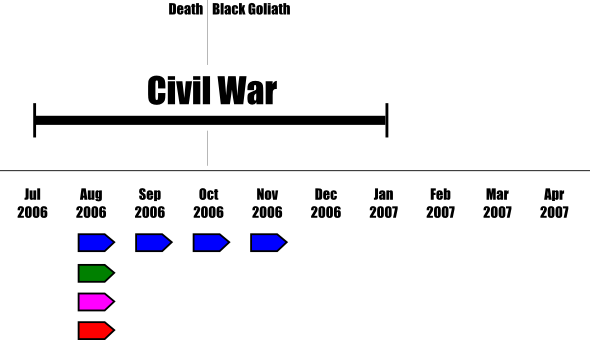 Concerning the name of the timeline, i'm thinking there would be at least two levels of the timeline that you could. so the user would pick an event, which would then display a timeline just for that one event. it would display all titles/issues that are part of that single event. date, instead of the publish date, since they will all have the same publish month and year. we would have to do multiple separate time lines. so there could be one for a title, which just displays all the issues of that title basically. one for a specific character which gives a timeline of all the appearances, deaths, etc. one for a specific event, which we have been discussing, which displays all the issues in that event. or did you mean something even more detailed like....event + character....which displayes all the issues in the event where character x appears. chronological order of being published. Hmm, I don't like that. A left and right time line is too rigid for something as fluid as comic book event time lines. Especially when it comes to time travel stuff and publishing schedules that are delayed and messed up. Here's what I propose. An interactive "mind map" of comic book events. That way you don't run in to the problem of time "jumps" when you are trying to synch up two conflicting horizontal time lines. Plus, no need for multiple time lines for separate titles and what not. To find out more about the event you just navigate a different branch of the spider map or zoom out to see how things connect together. date the comic was published, and not what its contents hold. OK, the way you worded it I thought it was the other way around. I think as long as the main time line is of the even itself. That works. I figured the word 'past' should be included, so viewers know that the comic telling that story actually came out at a later time. That's one idea for that. Moving in/out of alternate timelines would be tricky, I'll keep thinking about that. Worst case scenario would be a completely separate timeline. I checked out the example timelines, I almost prefer the look of the JFK assassination one because it doesn't have pictures. And honestly I think it would be cool with pictures, I am just worried it would look too cluttered with images, lines of events/storyarcs, and instances. I supposed if the timeline was stretched out enough or the pictures were small enough it would work fine. I was not thinking that detailed. What I was thinking about more was smaller storyarcs that people don't really care about or events that only affect one character, that people may not need/want to see when they are looking at a big picture timeline. But if the user wanted, they could go ahead and toggle that title or character's events to the timeline. i think this needs to be limited to single specific item. timeline for that specific event. up taking alot of time and space to maintain. dont have to keep rewriting code. Because of long standing histories like Batman, perhaps a certain year limit could be imposed for initial loading of the timeline? And, as an afterthought, what about writers/drawers/inkers? Would seeing their info on a timeline be beneficial or valuable to anyone? I'm impartial, it just came to mind because the information is there.